December 1 (Tuesday, 7:00 p.m.) Kerrington Adams, Senior Historic Preservation Specialist at the Cleveland Restoration Society, presents The American Home Interior: Treatment and Transformation in a "CSI" style manner where he examines the processes curators and preservationists use to restore interiors based on physical evidence, literature of the era, and searching out appropriate reproduction treatments. 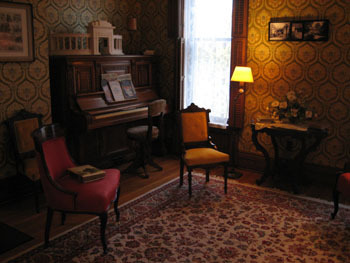 Covering the broad period of 1850-1950, the program is designed to appeal to owners of older homes as well as to anyone who enjoys period furnishings, decor and styles. Adams has been on the staff of the Cleveland Restoration Society since 2004 and previously worked on historic house interpretation and restoration in Ann Arbor, Michigan, Dayton, Ohio, and at Hale Farm & Village. This free event is co-sponsored by the Oberlin Heritage Center, the Cleveland Restoration Society, the City of Oberlin Historic Preservation Commission and the Lorain County Preservation Network. It will be held at the Oberlin Public Library.